← H8 is 2 much fr8 2 carry through life! Some time ago I saw (in my spirit) a mighty revival train rolling and rumbling through Nashville. Since that time, numerous times a week, I have seen (with my natural eyes) rows of the same number repeated 3 or more times — like 111, 8888, 444, 55555, or 777. It has happened far too many times to be coincidence. My wife and I have prayed about what it means and we get “alignment.” I believe God is aligning people and circumstances to His will so that He can release a mighty revival to begin in Nashville and spread around the world! 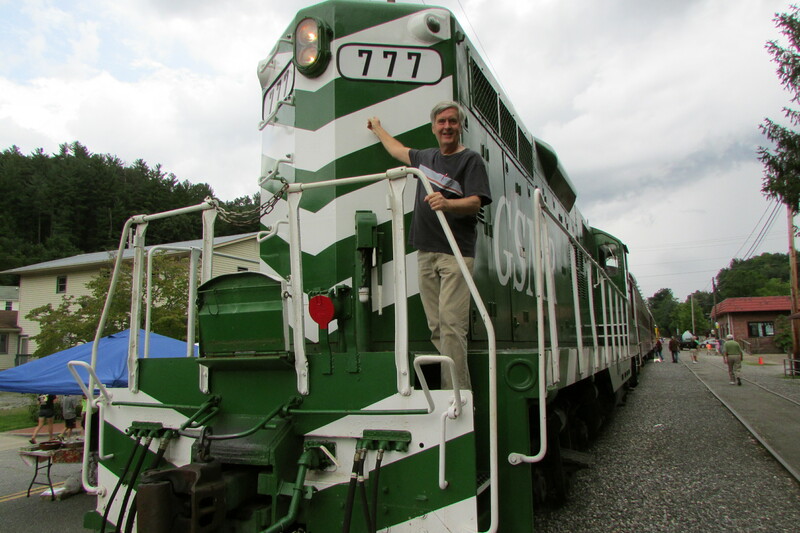 A couple of months ago, my wife and I booked a train ride on the Great Smokey Mountain Railroad in Bryson City, North Carolina on this train. When we arrived at the depot, we noticed that it was marked 777! Ever since encountering the living Jesus Christ while a freshman in college, I’ve longed to see revival — a widespread movement of believers getting on fire for Christ and unbelievers becoming passionate, life-long Christ-followers — and I still seek, long for, and pray for revival. Over the years, I’ve come to believe that our Sunday morning church format greatly hinders revival by stopping the free moving of the Spirit through tradition, human control, fear of being out of order, and prepackaged programming. I believe that one of the keys to revival is believers gathering not to sit and watch programs, but rather to corporately listen to and obey the promptings of the Holy Spirit. That’s why I talk about participatory church so much! And that’s why I like Kester Brewin’s quotation and find it greatly encouraging. Anybody ready to “radically transform” the way we do church (“our corporate practice”) and help bring on the revival train? Get on board and experience participatory, organic church in Nashville at The Salvation Army Berry Street, 225 Berry St., 37207 on Sunday mornings at 10:45. This entry was posted in Bryson City, Great Smokey Mountain Railroad, how we do church, Kester Brewin, Nashville, Nashville church, North Carolina, People get ready, quotation, Quotations, quote, Smokey Mountains, spiritual movement, spiritual visions, train rides and tagged lyrics, quotes, revival, Rod Stewart, spiritual awakening, There's a train a comin', trains. Bookmark the permalink. For almost 15 years, I was a part of a church that eschewed the clergy/laity system in favor of a full-body church that valued the “operation and the measure of each one part – Ephesians 4:16″. It was very much “participatory church” and they expected it to be a worldwide revival, and to some limited degree it was/is. But I think that regardless of the base model, the method of replication/growth of such a thing eventually becomes flawed, dominant personalities emerge, the freedom in and of the Spirit becomes bound by dogma about definitions of “freedom”, pneumatic-legalism is formed, and the cycle of dead religion is once again renewed. I have come to believe that until all is made new in the next age, we are going to have the same flawed systems that we have seen in the Church since the beginning, because the Church is constructed with flawed people. There will always be those who heed the call to go outside the camp, and while we would hope that call would be heeded by the entire body of believers, there is nothing in the history of the Church to lead us to believe that will ever be true. Because we are humans, most of us will be slaves to the convenient and the fashionable– I believe this is why we have more than 2000 years of Christian history that is filled with stories of remnants of believers who broke with tradition and pursued something fresh and pure only to create new systems and dogmas that would again require fresh remnants to emerge from them. I think it is perfectly fine to live in a very present way with the Lord and not have to imagine future movements that cause things to change. In the biographies that I have read about believers that radically changed things, I find a common thread– most are following a personal leading of the Spirit. They are generally not aware of how much their lives will impact not only others in their time, but those in the generations that come after. I earnestly believe that the Spirit moves in the Body and that the same Spirit that moves in one member to be an engaged member in a participatory church is the same Spirit that moves in another to be an engaged member of a liturgical church– because it isn’t so much about the format, but about the joints of supply that connect and minister to us all. In the end, simply be faithful to whatever heavenly vision you are granted, abide in the Vine, and be a joint of supply wherever you are. There is not one train, but many trains on many different tracks all heading to the same destination, all powered mysteriously by the same engine. Thanks for your comment, PJ. Most Salvation Army centres hold weekly worship services, usually on a Sunday. These meetings have a relaxed atmosphere, and can include hymn singing, Bible readings, testimonies (members of the congregation talking about their Christian experiences), and presentations by worship or drama groups. The hymns and songs may be accompanied by a traditional Salvation Army brass band or a more contemporary worship band with keyboard, guitars, drums and other instruments. The Songsters (choir) may provide a vocal lead or present a reflective musical item. Bill. In my experience, I’ve found most SA church meetings to be like a typical Protestant service. However, I have also discovered that SA leadership is open to people who have a vision for spiritual innovation.